It was 24°F. when I left to teach yoga this morning. 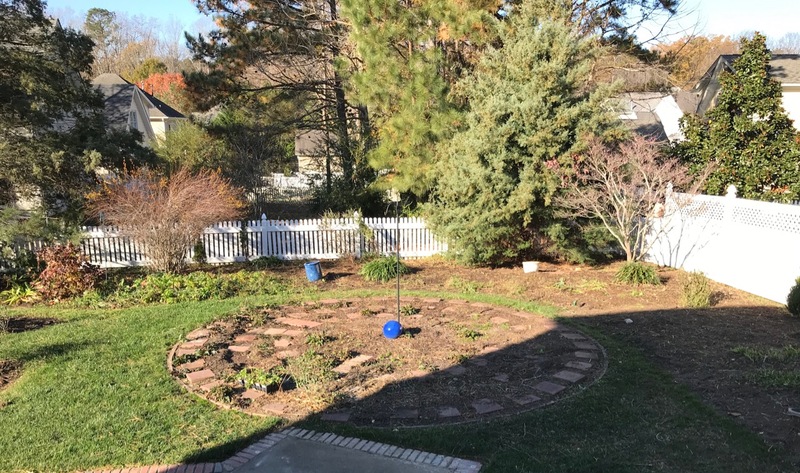 After class I braved the still below freezing morning temperature to explore the recently cleaned up garden. 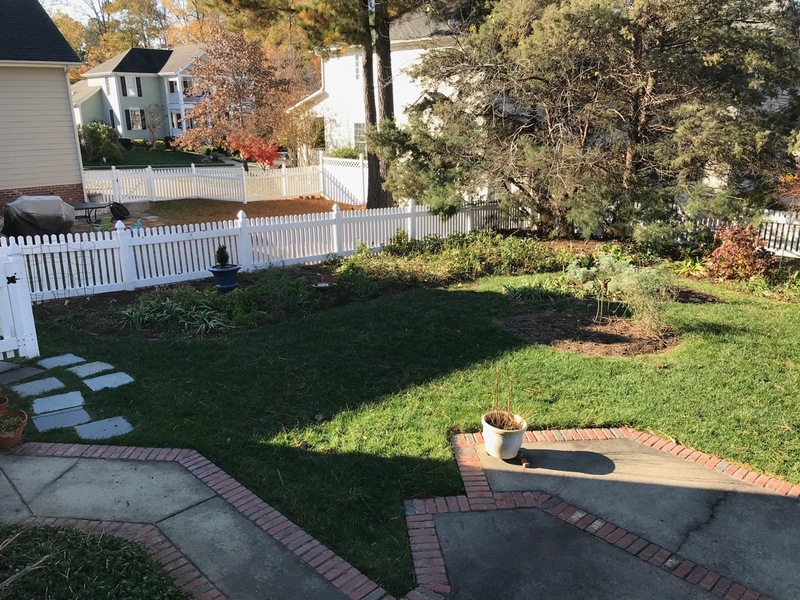 Usually I wait for late winter/early spring to begin the clearing, but I hired some gardening help this year because the garden has gotten out of control. Voles had destroyed a Blue Point Juniper hedge and those trees were dying all summer. Finally now they are all removed and the southern border looks very exposed. Now I can see the outlines of the beds. It is not really a clean slate because there still are many aggressive plant roots biding their time, but for now I feel relieved. The meditation circle is free of obstacles and I can reset the stones and enjoying walking the labyrinth once again. My last minute bulb ordered arrived just before Thanksgiving and I can start getting them in the ground. 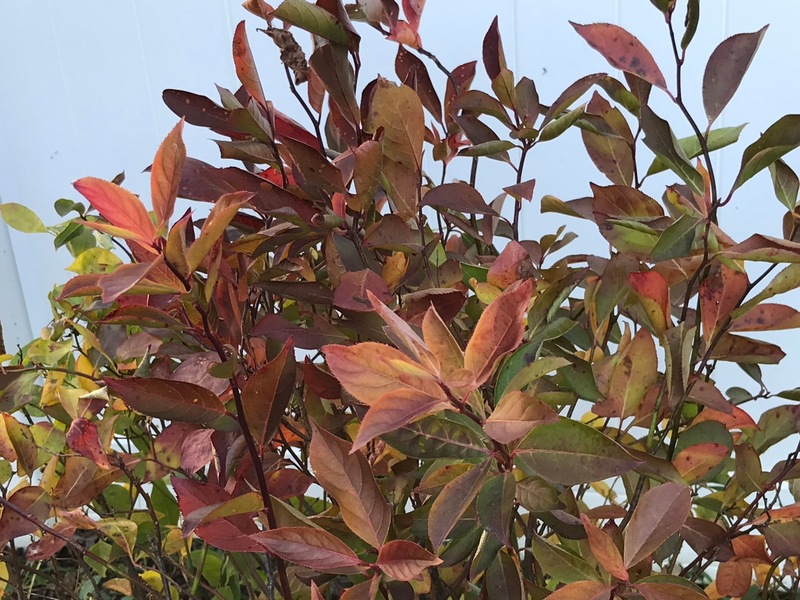 A dwarf Itea with its nice fall color was revealed during the clean-up. Inexplicably the shrub was planted several years ago at the back of a border, where it is hidden most of the time. 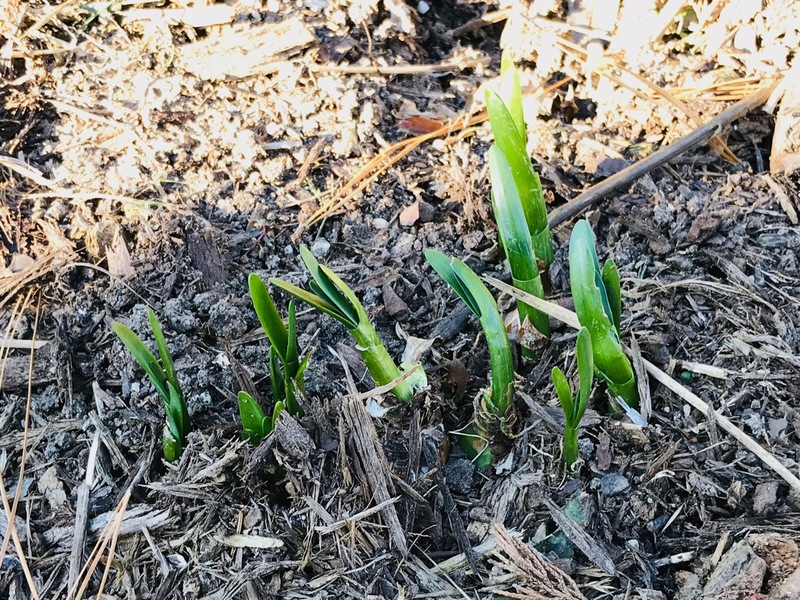 Confused, little mixed-up daffodils found the weekend’s 60°F. warmth encouraging enough to peek out. They don’t seem phased by the deep chill. 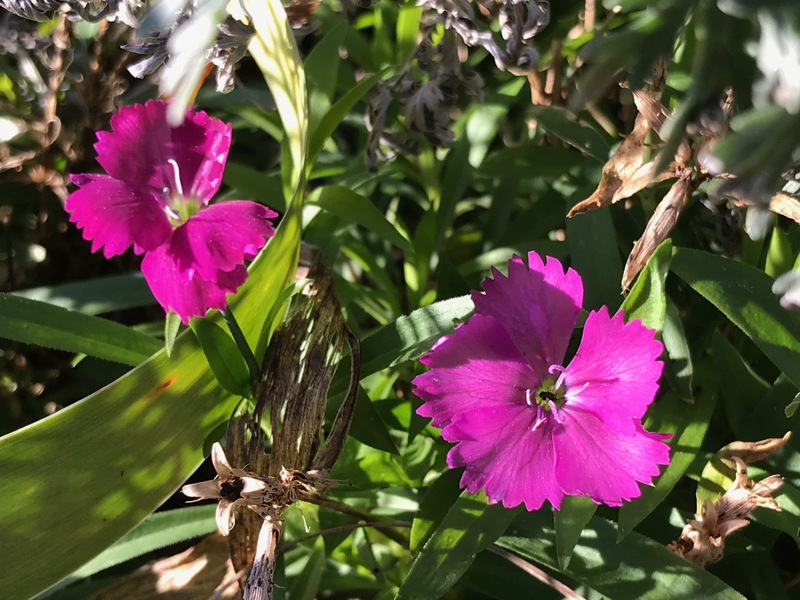 After the clean-up there is little left in place to offer unexpected blooms, but a couple of dianthus flowers stood out in the sunlight. 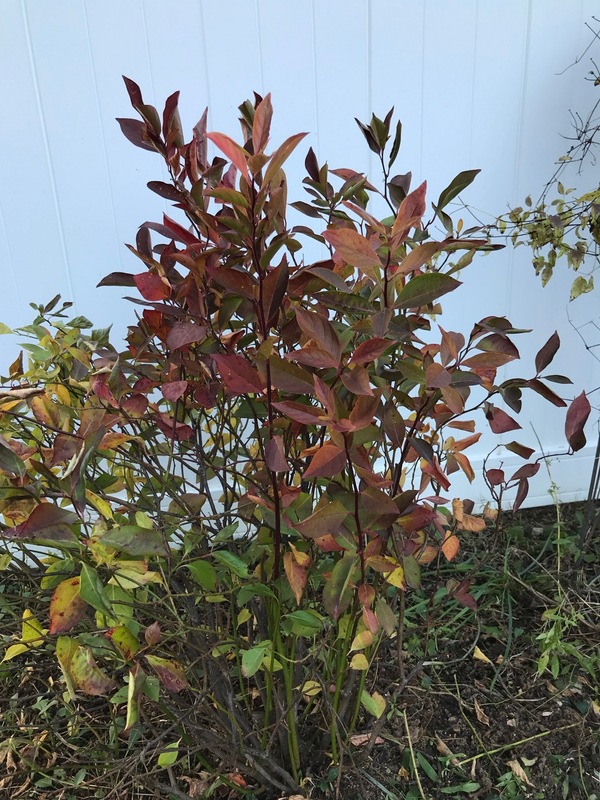 This entry was posted in garden and tagged itea, Itea virginica 'Sprich' LITTLE HENRY (Virginia sweetspire), late fall garden on November 28, 2018 by pbmgarden. Such a nice tour of your garden. A major clean-up is always useful in providing new perspective and opportunities. The sweetspire was a nice discovery. Best wishes with the bulb planting exercise and I hope the confused daffodils manage the transition to colder temperatures. Having some help sounds good. I think sometimes a fresh look helps. I haven’t even started cutting back. Wow! It looks like everything was removed – surely not? I usually leave most of the cutting back until spring but this year I am slowly working my way around the garden clearing and weeding. What will you plant instead of the trees? Gophers eat the weirdest things. Juniper could not have tasted good. They ate agaves and aloes at work. I would think that agaves would be too caustic for them. Isn’t it great when you discover a “new” plant that you’ve actually had for years? Yes, but I do feel silly for planting it where it can’t be seen. I think I added Itea because I’d enjoyed seeing yours. Thanks Julie. It feels satisfying to be one step ahead of those weeds. If the rains stop I’ll get my bulbs planted and will feel back on track.